Making friends and raising funds for institutions of higher learning are two things that Greg Carter believes he was born to do. And as the new associate director of development for the University of Mississippi School of Engineering, Carter said he is truly fulfilling his calling. Carter comes with a proven track record of successful fundraising experience. 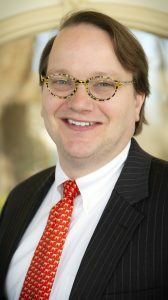 He formerly served as the associate vice chancellor for external relations at the University of North Carolina-Asheville and as special assistant to the chancellor at the University of North Carolina at Pembroke. Carter was also a legislative assistant in the U.S. Senate. There he often worked with universities to help identify appropriation needs. Carter earned his bachelor’s degree from Bradley University, a master’s degree from Miami University and an MBA from Southern Methodist University. In his new role in the UM Foundation, he will be working closely with the dean, faculty and staff to raise funds to ensure the School of Engineering offers the finest opportunities for education and research. Carter said he’s appreciative of the warm reception he has gotten so far from within the university community. Dean Dave Puleo said Carter is also a welcome addition to the engineering school’s support staff. Carter is married to Jennifer Key, a graduate student in UM’s Department of English. In addition to caring for their pets, they enjoy swimming, hiking, biking and reading. For further information about making financial contributions to the UM School of Engineering, contact Greg Carter at 662-915-3937 or at gjcarter@olemiss.edu.